Our first All Star Clinic for 2019 features 6 world class coaches and judges! Get your entries in quick to avoid missing out. Book two jumping (XC or SJ) lessons and save $10! Contact Monique Batterham, HRC Clinic Coordinator on monique.batterham@icloud.com or on 0404 857 600. 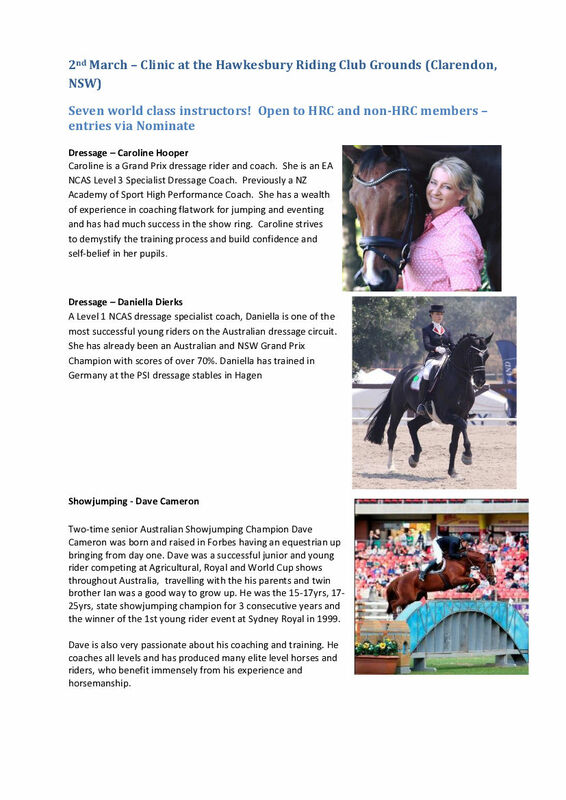 Caroline Hooper and Daniella Dirks will be available for 45 minute private dressage lessons. Each lesson will be held in a full sized, outdoor sand arena. Lessons are $110. Want to learn how to improve your dressage scores? Sue Scaysbrook, an A level judge will be holding dressage protocol lessons in a full sized sand arena in 20 minute sessions. You ride your choice of test and Sue will mark you as if it was a competition. After your test, you'll then have about 10 mins with Sue one-on-one to discuss feedback and go over any areas of the test/movements. You'll also get to keep your test paper. For only $40 per test, why not have a dressage lesson followed by a protocol test? In response to demand, we have Bonnie Martin running 2 x pole training groups - beginner which is perfect for green or nervous horse or riders will be limited to 4 riders to keep it small and an open class which is limited to 6 riders to do some more challenging exercises. Super for dressage horses to promote rhythm, flexibility and athleticism - or if you just want to do something different. Will be set up in our normal dressage warm up area (grass, open to XC ground on two sides). Focussing on rider position, horse pace and rhythm, spend 75 minutes with Bonnie Martin in a small group of just two, to really hone these critical skills as a showjumper under the expert eye of Bonnie. Lesson cost $75. We welcome back Dave Cameron as our All Star SJ coach. Lessons will be in groups of 6 max, and run for two hours. 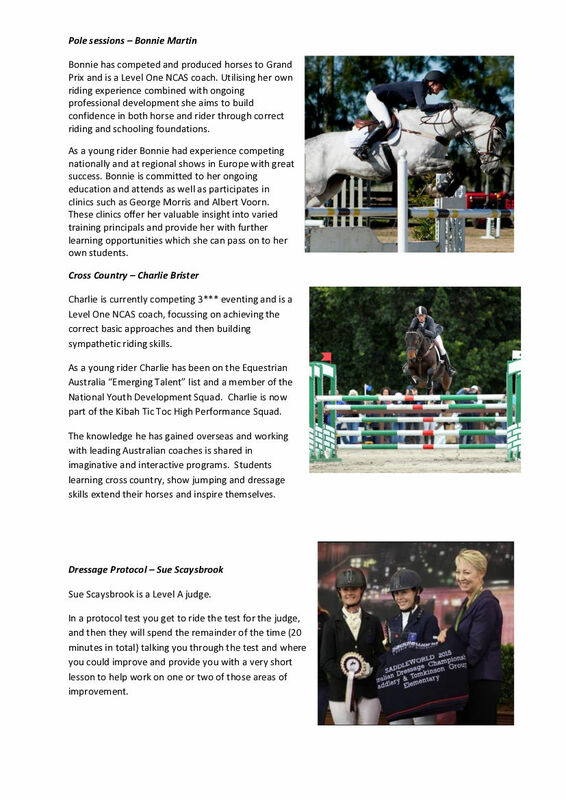 Dave's lessons will be held in our fenced Show Jumping area. 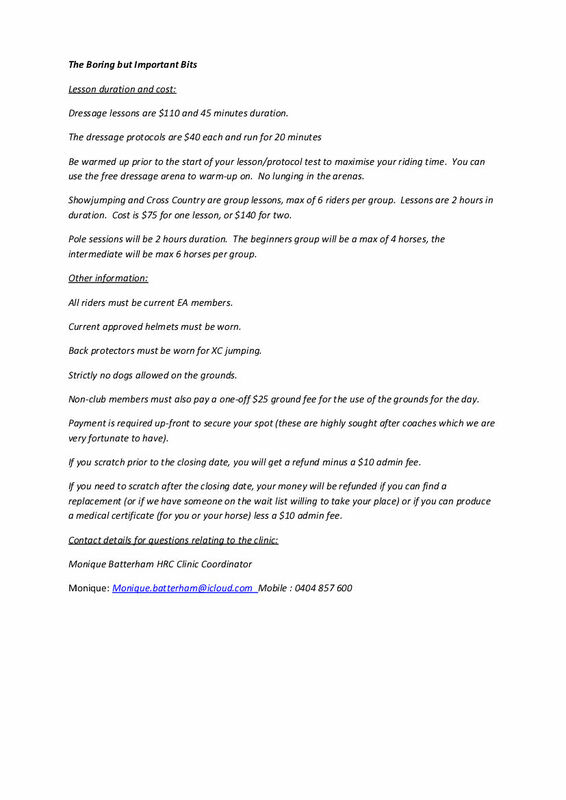 Charlie Brister will be conducting XC lessons on our fantastic XC course. Lessons will be groups of 6 max and will run for two hours. Riders must wear a XC vest.